I planted five varieties of tomatoes this year - Sun Gold, Riesentraube, Black Cherry, White Rabbit and an UBT (Unidentified Black Tomato -- well, not unidentified by the seller, but I didn't write down the name when I bought it at the farmers market and promptly forgot it by the time I was ready to label it). Of these five, the White Rabbit (purchased online via mail order) died practically immediately. Its stem was broken in transit and it never recovered. The seller, whom I contacted immediately upon receipt of the plant, never even bothered to respond. This experience has soured me on buying tomato plants via mail order, despite all the amazing-sounding varieties available. I'll be sticking to farmers markets or nurseries from now on. Black Cherry, purchased at the farmers market, has sulked and refused to grow since being planted. I suspect it may not be happy in its raised bed. That leaves Sun Gold and the UBT. The UBT produced a number of smaller-sized-than-regular-tomatoes-but-bigger-than-cherries and then has basically stopped growing at maybe 12 or 15 inches tall. The half-dozen tomatoes turned black but they still seemed really hard to the touch. I don't have much experience growing tomatoes, but I was concerned they might be unripe. So I turned to that Voice of Experience (my momma) and asked her what she thought. Her sensible advice? Pick one and see if it was ripe. Sliced Sun Gold and UBT. Notice that the Sun Gold looks pleasingly ripe. Not so with the UBT. Uh oh. That UBT didn't look ripe at all on the inside. The Sun Gold of course was delicious. These photos are slightly old, but despite our record temperatures in Middle Tennessee and the ongoing drought, the Sun Gold has continued to produce new tomatoes with a bit of supplemental water given twice weekly. I'm impressed and certainly plan to plant more Sun Golds in the future. I can see now why they are a favorite of home tomato growers. Has your tomato harvest begun? Which varieties are performing best for you this year? If you have photos of your thriving tomato plants online, please post photo links! That black tomato is just amazing! Never have seen one like that before. My tomatoes are kind of a sorry lot this year....have them in containers and they dry out soooo quickly. Thanks for your message, Janet. A black tomato? That's a new one!! A storm smashed my tomato plant tonight so I'll have to see what's left in the morning. Make sure you fertilize your plants heavily. They're big feeders. I've been giving mine Dr. Earth's vegetable fertilizer. They also like Alaska fish fertilizer, which is a liquid supplement you can add to your watering jug. My Rose of Sharon rarely reseeds and isn't invasive like the earlier cultivars. It's much better behaved. Sorry to hear about the storm damage, Casa. I probably should give my tomatoes some more fertilizer. I gave them Chickity Doo Doo a few weeks back (http://chickitydoodoo.com). I like to go for the simplest possible amendments. And I'll definitely check out that Heat Master tomato and the Rose of Sharon for future additions to the garden! The tomato I'm growing is called Heat Master. It was bred to perform well in hot, humid climates. So far, it's done incredibly well. 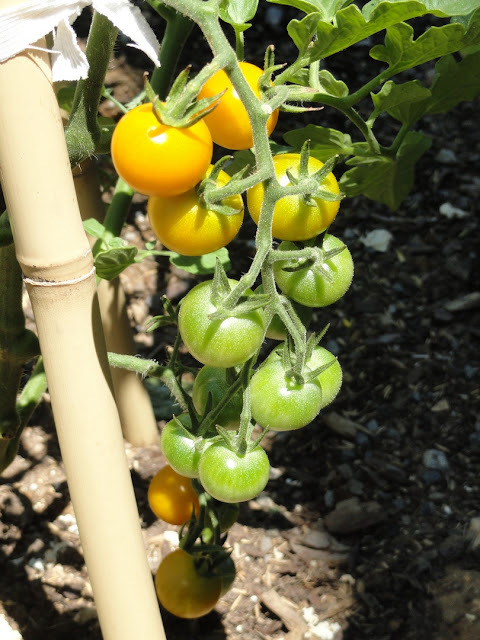 Those Sun Golds look tasty, might have to try those next year, I'm a yellow tomato fan. My only tomato plant is a Golden Jubilee and it's only about 18-20 inches tall, no flowers or fruit yet, planted in an empty spot in a flower bed. Next year I hope to build a raised bed or two for more veggies. Keep us posted on the success of your Golden Jubilee. Per Casa Mariposa's post, are you giving it fertilizer? I've actually had better success just planting in amended clay soil versus in the raised bed filled mushroom compost. I plan to write about my experiences with a raised bed in a future post. Here in Suburban Chicago we've got a few weeks to go until we can pick tomatoes. All of the varieties I planted this year are doing well though. 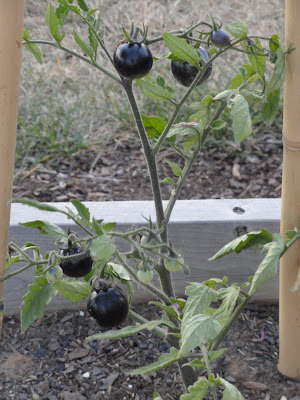 Interested in your black tomato because somehow I ended up planting almost all black tomatoes: Black Cherry, Black Prince, Black Krim - and, just to keep things interesting, Green Zebra. Looks like we will have an early harvest for Chicago - the largest fruit is about plum size. My Black Cherry kicked the bucket. And the UBT is looking like a goner too. (100+ degrees and no rain for a month will do that, I guess. Though a couple of the other 'maters like the Sun Gold and Riesentraube are doing fine. BUT they're not in a raised bed, which I suspect could make all the difference. Congrats on your tomatoes and thanks for sharing. Hope that you'll come back to post a Flickr link or something that lets us see the fruits of your eventual harvest! 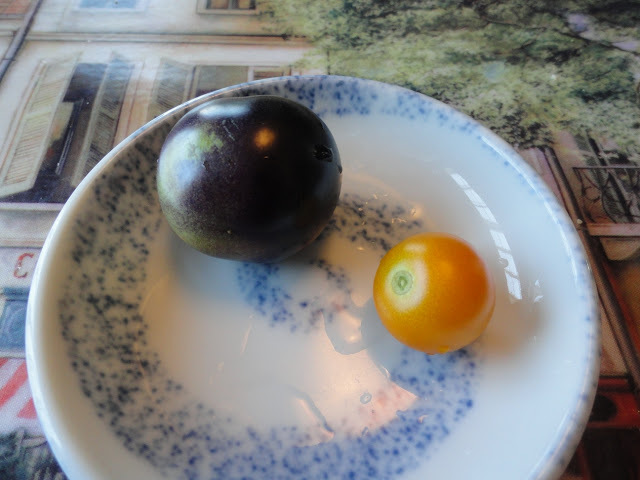 your unidentified black or rather purple tomato is Indigo Rose. 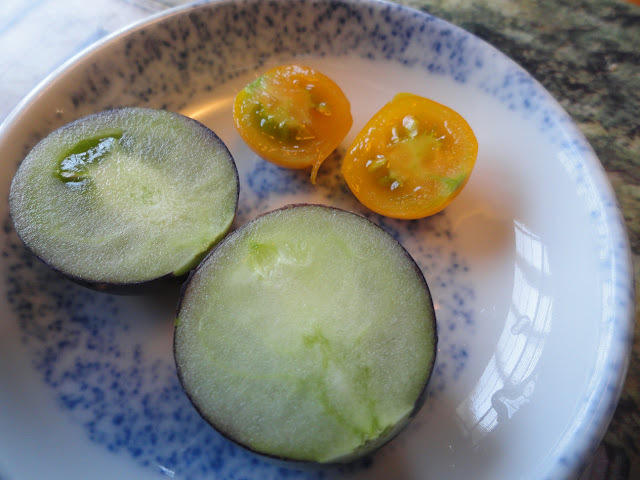 It will be true blackish purple on the side that hits sun and bright red once ripe on the shaded side. enjoy! Thanks for the comment and the plant ID, Jenny. At this point, Sun Gold and Riesentraube are the only two tomato survivors in my garden!